MEI’s Pully Bully will make changing a submersible pump or motor a snap! The Pully Bully is a safe, economical method that will save you time and frustration on your next service call. Roll the Pully Bully into the machine room. Detach the hoisting frame from the cart (the cart/drip pan will later serve as a workbench that collects the excess oil). Set up the hoisting frame (see photos below). 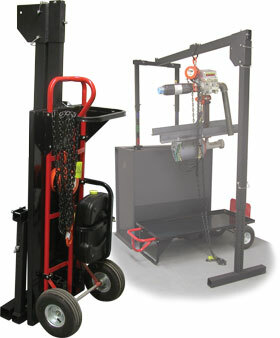 Use the chain hoist to rig and pull the pump/motor combination out of the power unit. Set the pump/motor combination on the cart/drip pan, and make the necessary repairs. The excess oil funnels into a removable container located under the drip pan. Simply remove the container and pour the excess oil back into the tank.